Paul Rivett (Lumison BlueSquare Data/Stancombe Vehicle Engineering) secured his third victory of the year in determined fashion to end the 2011 AirAsia Renault Clio Cup UK season as champion in its season finale, also securing his third Clio Cup title, more than any other competitor that has ever entered the series. Basked in glorious sunshine, Brands Hatch played host to arguably one of the most exciting endings that the series has ever witnessed, with four competitors all with a chance of claiming the prestigious crown that has previously been won by the current BTCC starts such as Tom-Onslow-Cole, Martin Byford and Dave Newsham. 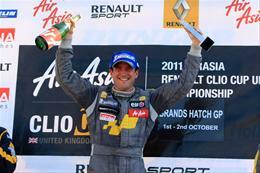 “It’s such a brilliant feeling to win the 2011 championship,” said Rivett. “If anything, this championship means more to me than any of the titles that I have won previously. I’m almost at the point where I am lost for words. The 2011 champion made a great start, leading Jake Packun (Get On Track Developments) into Paddock Hill for the first time, followed by James Colburn (Westbourne Motorsport) as Aron Smith (Team Pyro) made a nervy start off the line, dropping back to fourth in the process. Despite a brief safety car period caused by debutant Chris Smith (Scuderia Vittoria) ending his weekend earlier than he had hoped at Surtees, Rivett controlled the pace of the race throughout, continually setting fastest laps as he charged to the finish line, picking up a further two points. After making a flying start off the line, Packun was able to storm past Smith and Colburn to follow Rivett. The Bolton based driver continued his fine end of season form to finish second, matching his best result of the year gained on Brands Hatch Indy circuit at the season opener. Rivett remained in front and continued to pull away, leaving Packun to defend second position manfully from Smith who tried on countless occasions to gain back the place lost at the start. However, his efforts would be to no avail, Packun holding on to the flag. Joint series runner-up, Smith crossed the line in third position after dropping to fourth, coming out as victor in a dice with fellow runner-up in the championship, Colburn as the pair entered Westfield early on in the race. The Irishman pulled away from his rival and completed the podium with third. 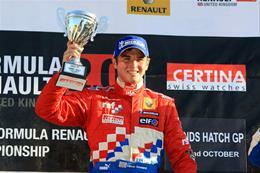 “I’m happy to have finished the championship in second position,” said Smith. “If someone told me at the start of the season that is where I would end up, so close to Paul going into the last race of the season then I would be absolutely over the moon. Still in with a mathematical chance of winning the championship going in to the last race, James Dixon (Total Control Racing) ended the season fourth in the championship after finishing the race in sixth, having started from seventh on the grid. Amongst the action packed racing there was also a matter of deciding who would emerge as victor in the Masters Cup, with both Darren Wilson (20 Ten Racing) and Mark Proctor (Total Control Racing) in the running for the 2011 honours. Proctor’s Graduate Cup hopes ended on lap nine after an error at Clearways saw him retire in the gravel, leaving Wilson needing to finish to take the win. Wilson did just that and also lifted the Graduate Cup, beating Proctor by 22 points. “I didn’t think that I was going to do that well this weekend, as I knew that I was off the pace here,” said Wilson. “I don’t think I’m brave enough around Brands Hatch, but it all seemed to come to me in the final race. I saw Proctor go off with about six laps to go and I knew that it was just a case of bringing the car home to receive the Cup. Of the remaining debutant’s, Ash Miller (Scuderia Vittoria) ended a productive weekend in the AirAsia Renault Clio Cup, bringing his car home in thirteenth on a track that the young Australian had never visited before. Elsewhere, Nicolas Hamilton (Total Control Racing) rounded off his first season as a racing driver by finishing in tenth place, just short of matching his season best result of ninth in round 15 yesterday. Hamilton finished fourteenth in the championship, a remarkable result for the youngster who has cerebral palsy. Fortec charger, Oliver Rowland took two comprehensive lights to flag victories today, in rounds seventeen and eighteen of the CERTINA Formula Renault 2.0 UK Championship, at a sun-drenched Brands Hatch circuit in Kent. Making the most of his brace of pole positions, Rowland dominated in both races. This morning’s race saw him streak away from Alex Lynn, leaving his Fortec team-mate to defend hard from fellow title challenger Tio Ellinas (Atech Reid GP) throughout the course of the opening laps. Manor Competition’s Alice Powell and Josh Hill gained the most on the first lap, both making up two places, overcoming Fortec duo Alex Walker and Ed Jones. Atech Reid GP’s Dan Wells dropped from fifth to seventh, with Daniel Cammish (Mark Burdett Motorsport) and Felix Serralies (Fortec Competition) making their way past the Salisbury-based driver. Wells would later re-take Serralies, only to spin on the last lap, at the off-camber Stirlings corner, during a last ditch attempt to overtake Cammish. Rowland began to pull out a healthy lead of almost three seconds over Lynn and Ellinas, who were embroiled in a fascinating battle for second place. Just behind the Cypriot driver was Jordan King, who was keeping ahead of the pacey Cammish, but making little impact on the Atech Reid GP driver in front. Eventually, on his eleventh time around the 2.3-mile circuit, the Racing Steps Foundation backed driver would break James Calado’s two-year-old lap record with a 1:23.038. Following a brief safety car period to recover the stricken car of Fortec’s Jones, who spun out at Paddock Hill bend when attacking team-mate Walker, Rowland got the jump on Lynn at the restart and remained in front to take his second win in three races. Championship leader, Lynn followed Rowland home, with Ellinas just behind, nine tenths of a second separating the top three after the safety car period. Despite trying a number of different approaches, Ellinas couldn’t find a way past Lynn, who made his Fortec as wide as possible. Rounding out the top four was Manor Competition’s Jordan King, who was unable to match the pace of the first three cars. King had a quiet race aside from the occasional attempt by Cammish, whose Mark Burdett Motorsport team-mate, Jack Hawksworth, rounded out the first six finishers. Going in to the day’s second CERTINA Formula Renault 2.0 UK race, just thirty-nine points separated Lynn and Ellinas at the head of the field now, Lynn with 482 points, Ellinas with 443 points. Grid positions for race two were largely the same as for race one; Rowland on pole with Lynn next to him, Ellinas third with King alongside. Lynn needed to finish in the top three positions to claim the title, and the Essex-based driver made a flying start off the grid, so quick in fact that he was judged to have jumped the start. A lap later, Lynn completed a drive through and re-joined last. With Lynn out of the picture, Rowland continued where he left off, driving into the distance, pulling out vital tenths on King in second and Ellinas in third. However, Ellinas would soon inherit second when King came into the pits for an unscheduled stop. Elsewhere, Hill was having a better weekend after his disappointment last time out. The son of the 1996 Formula 1 World Champion, Damon, had progressed five places on his grid position and would finish sixth, just behind Serralies. Try as he might, Lynn could only finish ninth, ensuring the championship will be decided at the final rounds in a fortnight at the legendary Silverstone circuit in Northamptonshire. Rowland completed a spectacular weekend by taking the double win, both pole positions and two fastest laps, not to mention setting a new lap record in the process. Ellinas profited from his championship rival’s start line error, and held firm to take second at the flag, leaving him 27 points behind Lynn. Joining Rowland and Ellinas on the podium was Cammish; the Mark Burdett Motorsport driver completed a solid move on Wiltshire-based Wells with three laps remaining and Wells hung on for his best finish of the season in fourth. Following this weekend’s events at Brands Hatch, and with the championship still up for the taking, the CERTINA Formula Renault 2.0 UK championship heads to the Silverstone national circuit for what promises to be a spectacular finale on 15th and 16thOctober.